If you are having troubles with cutting out!!!! Tring to register MJ again after task reboot, what gives? Performance Issues 128 vs 256 vs 512? A program to watch TC & MJ to restart or reboot? Buy a Thin Client Somewhere Besides Ebay? HP T5720 thin client power supply? 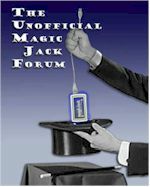 TWO MAGICJACKS, ONE TC, IS IT POSIBLE? Can you upgrade the ram on a HP TC 5520? HP Neoware c50 will this work with MJ? Is there a "best" TC system to use for MJ? The MJ no longer downloads the contacts and calls list!!! T5720 won't boot - help! Getting the thin client to ring multiple phones. Using a DOK to run XP full up?? Restoring my TC after the big MJ update trashed it. Wanting to set up magicjack with a thin client,help!!! Thin Clients with Windows 7, increased supply of old TC's?